We both think your site is absolutely terrific. Pets Pix are proud to present you with our award - you meet our criteria perfectly. You obviously love your cats, you care a great deal about the well-being of animals as a whole, and your love for what you are doing stands out clearly. Congratulations!! 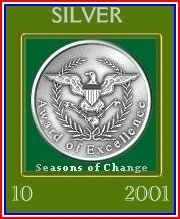 !Your site as listed above has been chosen as a winner of The Seasons of Change Silver Award for October 2001. I enjoyed my visit to your site. Thanks for making the web a better place. It is evident that you have put a lot of hard work into your web space. 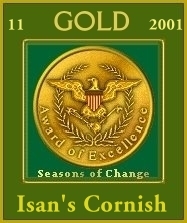 Your site as listed above has been chosen as a winner of The Seasons of Change Gold Award for November 2001. The Gold Award is the highest honour each month. Con~CAT~ulations!!! 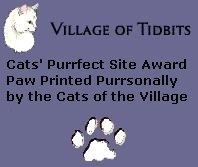 It's us Cats here and we are excited to tell you we have Paw Printed your site with the Purrfect Site Award! >^..^< Your score was a PURRFECT 16! !